Colleges of of Telangana State. For Telangana Degree College Lecturer posts candidates should have cleared NET or PH.D along with Post Graduation in respective subject. 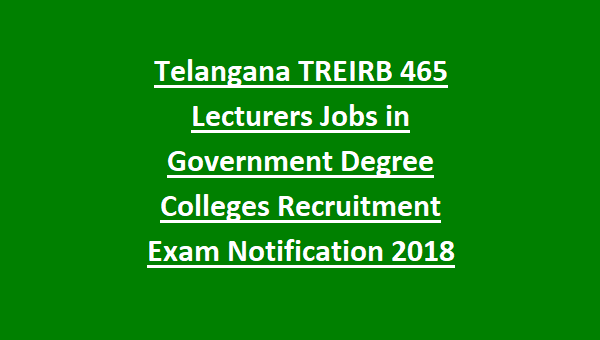 For REIS 465 Degree College Lecturer Jobs are available in 16 subjects of TREIRB recruitment 2018. 395 posts are for Women Degree Colleges Lecturers only. TREIRB filling this lecturer jobs in Government Degree Colleges of Telangana State. Selection for TREIRB Lecturer Recruitment will be through Written Exam and interview. Last date to apply online for this TREIRB Govt Degree Colleges Lecture Jobs is 13-09-2018. For more details regarding Telangana REIS Degree College Lecturers Jobs educational qualifications, exam pattern, exam syllabus, selection process, salary, age limits, how to apply online and other details are given below. 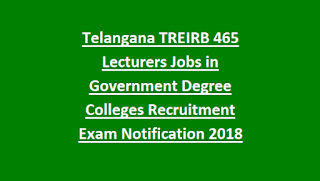 There are total 465 Degree College Lecturer vacancies are available in this current recruitment of TREIRB. For Govt Degree College Lecturers jobs age limits are 18-44 years. For SC/ST, BC candidates 18-49 years. For NCC Instructors, EX Serviceman 18-47 years. Selection for Degree college lecturer jobs is based on written exam and interview only. Written Exam will be conducted for 200 Marks. There is two paper are in this written exam. Online applications only accepted for these Lecturer posts of Govt Degree College of Telangana Residential Educational Institutions. It is mandatory to provide valid email id, mobile number. And Upload latest Image and signature in given sizes.